As the leaves have changed and the air becomes crisp it's clear that Thanksgiving is upon us. In planning for the holiday one can be mindful of a well dressed table to make surroundings warm and inviting. Whether you are having friends over for a casual "Friendsgiving" or you look to impress your guests for a large feast. We've come up with three different looks to help you complete your tablescape. So step away from the burlap and fake leaf garland...we're going shiny and fresh this season. Our first look is "Elegant" and it includes all the bells and whistles you can think of for setting a table. Including things like a beautiful fresh floral centerpiece, colored mercury glass pumpkins and candles...lots of candles. Using a variety of seasonal flowers to arrange such as mums, sunflowers, and eucalyptus adds a rich and vibrant element of bounty to the table. Golden chargers create an jewel effect to add a shiny pop...and don't be afraid to mix metals with your table decor too. Candle sticks and lanterns are a great way to do this and using varying heights of candles creates added ambiance. 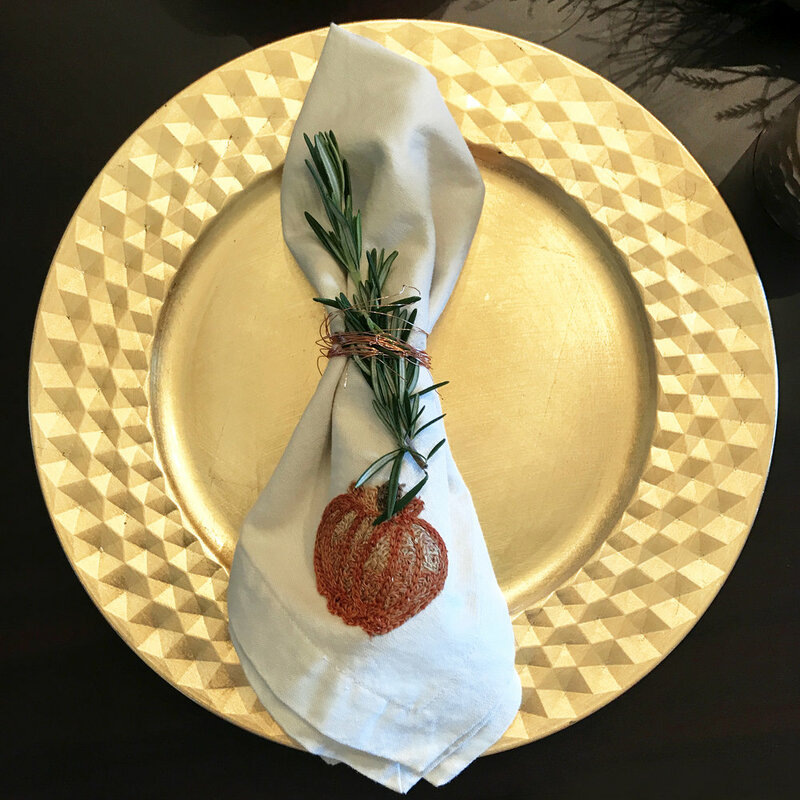 Make unique hand-made napkin rings with fresh rosemary and copper wire for an added natural element. The second look is a more "Casual" inspired table setting using decor items you may already have around your home like a throw blanket and real mini pumpkins. Using low candle lighting with simple hurricanes lined up gives a clean and modern table center where conversation can easily flow. This look is great for having friends over or for that last minute soiree. Natural paper tags are a simple way to combine a napkin ring and place card element for guest seating with this look. 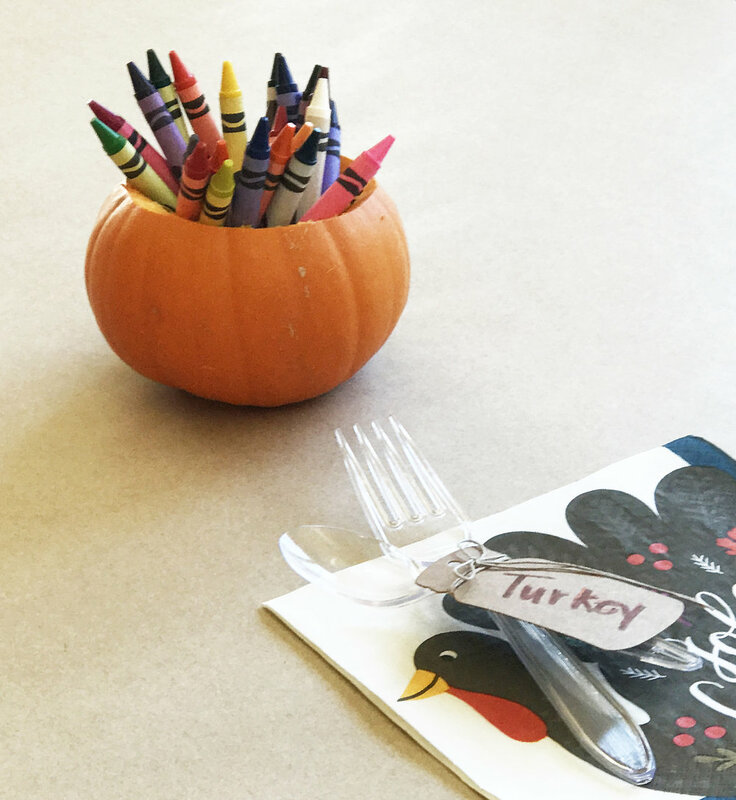 Let's include the little gobblers in the table looks with a "Kids" tablescape that's fun for everyone. Line the table with inexpensive craft paper as a runner or tablecloth to keep the youngsters occupied while pulling together the final dishes to serve. The kids can draw their own version of a turkey or play games like tick-tac-toe with their neighbor. 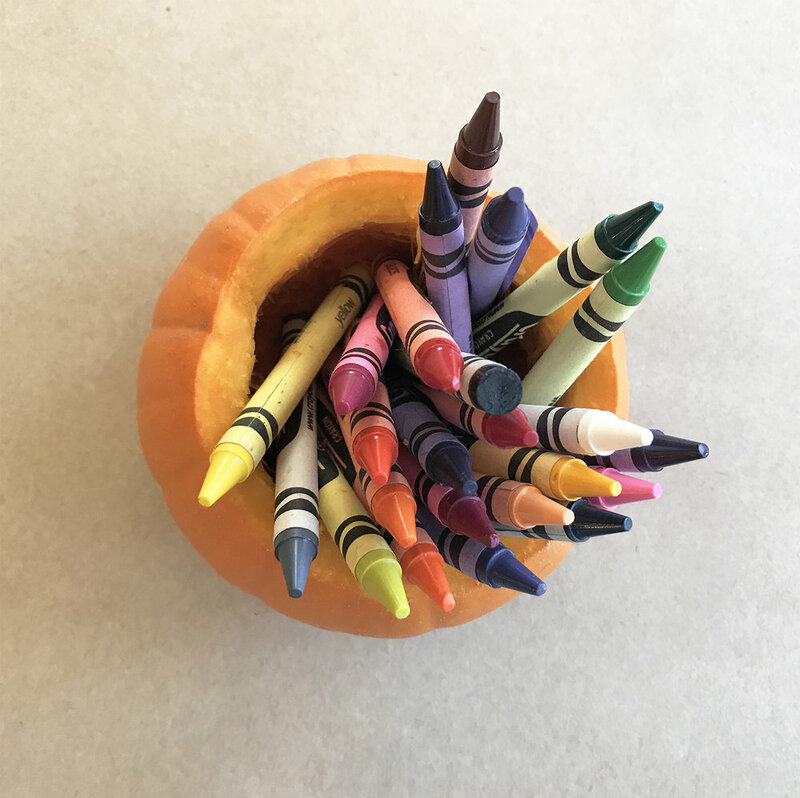 We've carved out a mini pumpkin to add a pop of color and usefulness for storing crayons on the table. Cute thanksgiving day inspired paper napkins, plastic forks and paper tag napkin rings complete this easy-does-it look. We hope you have a wonderful time sharing great food and warm conversation around your table with family and friends this Thanksgiving! We're incredibly grateful to each and every one of you for being a part of our design inspired world.